Amorphous magnetic cores allow smaller, lighter and more energy efficient designs in many high frequency applications for Invertors, UPS, ASD (Adjustable speed drives), and Power supplies (SMPS). Amorphous metals are produced in using a rapid solidification technology where molten metal is cast into thin solid ribbons by cooling at a rate of one million°C/second. Amorphous magnetic metal has high permeability due to no crystalline magnetic anisotropy. Nanocrystalline cores improve on standard Amorphous magnetic properties by a highly controlled annealing process to create a uniform and very fine nanocrystalline microstructure with grain sizes of ~10nm providing 1/5th the core loss of Fe based amorphous metal. Where typical ferrite cores can only operate up to a flux saturation level (Bsat) of 0.49 Tesla, an amorphous metal core can operate at 1.56 Tesla. Combined with operating at permeability similar to high-end ferrites and the flexibility of manufacturing large cores sizes these cores can be an ideal solution for many of these components. Nanocrystalline amorphous metal offers size, core and labor savings for various power conversion and EMC applications. These are brand new materials produced by applying a controlled magnetic field during annealing to industry leading thin nano crystalline ribbon. This provides a material that satisfies both high saturation magnetic flux density and high permeability. Other standard features: Low core loss, Low magnetostriction, Excellent temperature characteristics and small aging effects, Excellent high frequency characteristics and the Flexibility to control magnetic properties " B-H curve shape " during annealing process. Three phase designs can be done with standard single-phase cores or a custom three-phase amorphous metal core can be constructed in a two-piece set as shown. These amorphous cores wound in a C-core configuration, are ideal for AC Reactors and DC inductors from 10 to 1000+ amperes. The C-core also allows for single phase and three phase transformer designs. Amorphous metal C-cores allow for operation at higher frequencies at the same flux level. Where traditional steel cores need to operate at increasingly lower flux densities as the frequency increases. In order to compensate for running at lower flux densities significantly more material is needed. Even with additional material higher temperatures still occur. Another contributor to lowering losses is the I2R of the winding. A physically smaller amorphous core reduces your mean length per turn, hence your I2R copper losses are lower and copper costs are lower. Further improvements can be realized by using Nanocrystalline C-Cores. In each of the above options, the winding can be accomplished on a separate mandrel and assembled onto the C-core after the winding process. Litz is wire commonly used for high current/high frequency designs. However, terminating litz wire for these applications can be expensive. An alternative to consider is disc or edge winding. This involves winding a rectangular wire that has a relatively high aspect ratio on its edge The quasi-planar structure reduces the skin effect, but not as great as using litz wire although greater than can be realized with similar magnet wire or copper foil. Other advantages are: lower copper loss, reduced DCR, smaller size, improved heat dissipation. When comparing Iron Powder to Amorphous core. The Amorphous core will tend to be less expensive, and have lower losses, smaller physical size, better heat dissipation, and are mechanically rugged. The will have lower power loss and smaller however cost will be slightly higher. We produce rectangular shapes of amorphous metal cores by stacking layers of laminations made from amorphous metal ribbon. An adhesive rated for a continuous operating temperature of 155°C holds the laminations together. These forms offer a unique combination of high saturation induction (1.56 T), high permeability and low core loss and can be configured into various shapes, allowing for one large gap to be distubuted across several smaller gaps, reducing fringing flux, and core loss. Microlite XP Partly crystallized iron alloy Sizes to match application requirements. These are Metglas® cores manufactured with iron-based Metglas® amorphous Alloy-SA1. They offer a unique combination of high saturation induction, high permabiliity and the lowest core loss available for high frequency choke cores allowing the use of significantly smaller sizes than possible with conventional materials. Available in both coated and boxed cores. Applications: DC Output Inductors; Flyback Transformers; Differential Mode in Chokes; PFC Boost Chokes - Continuous Mode. This is an amorphous alloywhich also non-crystalline in nature. Metglas® MICROLITE XP cores operate cooler and have lower core losses than cores made of conventional crystalline materials such as powdered iron, ferrite or sendust. MICROLITE XP's energy-efficient properties reduce the size of powder sources for demanding applications in the electronics industry. 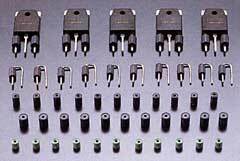 Applications: Differential Input Inductors, PFC Inductors, Flyback transformers, and VRM Inductors. These cores are manufactured with cobalt-based Metglas® amorphous alloy 2714A for high frequency applications. Theses flat loop toroidal cores offer a unique combination of ultra-high permeability, high saturation flux density and extremely low core loss for electronic component designers. Applications: EMI Common Mode Filtering; Telecommunications and Data Communications Interface Transformers; High Accuracy Current and Pulse Transformer Ground Fault Protection Devices. These cores are manufactured with cobalt-based Metglas® amorphous alloy 2714A which allow the design of MAG AMP that can operate at higher frequencies than previously possible. Their combination of magnetic properties enables these MAG AMP cores to provide unparalleled precision and efficiency in output regulation. Available in both coated and boxed cores. Applications: Saturable Reactors; Magnetic Amplifiers. These cores are ideal candidates for PFC boost inductor applications in power supply ranges from 300 to 6kW (for higher power design see Powerlite). Microlite 100μ are tape wound amorphous toroidal cores with a small gap, which allows the core to achieve permeabilities less than 245. The amorphous metal core is stable over a wide temperature range and offers a design with fewer and smaller gaps than comparable E-core ferrites. The fewer gaps and smaller gap size greatly reduces EMC concerns from fringing flux and stray field. Most designs can be constructed with few turns and lower losses providing a smaller more cost effective design. In some cases these cores maybe a good alternative for differential input inductors, and SMPS output inductors. Various standard core sizes are available. For the ultimagte PFC boost inductor solution contact us directly on our new Advanced Amorphous A-AL material. These cores are manufactured by pulverizing amorphous ribbon and pressing this powder into toroidal shapes, using amorphous alloy. allowing the designer of PFC boost inductors to reduces size and power loss as compared to conventional solutons. This A-AL material is a unique in its combination of low core loss and high DC bias which enables these cores to provide unparalleled precision and efficiency. Contact us for availablity in both coated and boxed cores. Common Mode Chokes (CMC) made with Nanocrystalline material have superior characteristics when compared to the most commonly used material Mn-Zn ferrite. The potential of designing a smaller CMC with the same number or fewer turns is of interest to many designers. Nanocrystalline materials offer this possibility by providing a complex permeability (µr at 100kHz and 20C), which is more than twice that of Mn-Zn ferrite. The impedance relative permeability (µrz) is more than four times as high as Mn-Zn ferrite. In one case this allows the designer using Nanocrystalline material to use a core of identical size to Mn-Zn ferrite which will produce four times higher impedance with the same number of turns. In another case the designer can use this material to reduce the windings by ½ and to obtain the same low frequency impedance significantly reducing stray capacitance, as a result high frequency impedance also becomes large. The below charts show the higher impedance benefit of nanocrystalline material verses Mn-Zn ferrite. For the designer interested in winding an inductor for a specific application we have available the following standard cores for single-phase requirements. These are toroidal shaped tape-wound cores made from nanocrystalline amorphous metal. The below table lists; Product code and part number for cores made with FT-3KM material and new FT-3KM50T upgraded version of FT-3KM. For the designer interested in winding an inductor for a specific application we have available the following standard cores for three-phase requirements. These are toroidal shaped tape-wound cores made from nanocrystalline amorphous metal. The below table lists; Product code and part number for cores made with FT-3KM material. If you require much larger cores for common mode chokes with rated currents over 100Amps these cores offer you the size to solve these RF noise problems. They can be used for signal lines, DC power lines, and AC power lines. Because of the low magnetostriction these core also provide low audible noise. Cores with base plate only, require cabling with the appropriate BIL insulation for the voltage being used. L type cores are used when a DC offset is present, see BH curves. Standard wound common mode and choke cores are available as standard products for DC and single-phase AC power lines (rated current from 5A to 40A), and for three-phase AC power line (rated current from 3A to 600A). Custom designs are available upon request, for your application you can pick the standard product that most closely meets your needs, or fill out our request form for a recommendation. Typical applications include various portions of the power supply / inverter such as input single and three phase noise filters, active harmonic filters, output noise filters, DC Power Lines or Signal Lines. The saturation magnetic flux density is twice as high as that of Co-based amorphous metal and three times higher than that of Ni-Zn ferrite. The pulse permeability and the core loss are comparable to Co-based amorphous metal. As a result, a small core made of this material offers higher performance in suppression of surge current and voltage. These cores also feature low core losses and a very high squareness of the BH hysteresis loop resulting in a high inductance when the current crosses zero. This high inductance effectively blocks reverse recovery currents created by diodes. The material saturates at relative small currents. Thus, spike blocking is not possible at DC currents. These cores are used for medium and large power and are toroidally wound cores which show excellent performance for the suppression of various kinds of current or voltage surge, such as a surge from a switching diode. Core range in size from outside diameters of 11 to 38mm and inside diameters of 4 to 22mm. Nanocrystalline amorphous metal is produced by rapid quenching a molten alloy to produce a amorphous metal and then heat treating this alloy at higher than its crystallization temperature The alloy forms Nanocrystalline grain size of approximately 10 nm in the amorphous metal. M type material is done with no magnetic field applied during annealing We produce H and L type BH loops by annealing with magnetic fields oriented either parallel or perpendicular to the ribbons surface. Excellent temperature characteristics. Very high Curie temperature (570°C) resulting in small permeability variation (less than +/-10%) at a temperature range of -40°C to 150°C. Less affected by mechanical stress. Because of the low magnetostriction permeability and core loss changes have very small changes. Very low audio noise emission. Lower magnetostriction significantly reduces audible noise emission when the voltage and current applied to the core at audible frequency range. Ribbon is cast in widths up to 8 inches in wide and then is slit to width required for winding. Special winding machines wind the ribbon in to various Toroidal, Oval and C-core shapes. Cores then are further process via cutting, coating, annealing according to standard offering and customer requests. For several years now, electronic watt-hour meters have more and more replaced the electromechanical Ferraris counters in the industrial world. Since their advantages are self-evident, it is now foreseeable, that domestic counters will also be substituted by electronic versions within the next decade.